apanese shipbuilder Mitsui Engineering & Shipbuilding (MES) delivered a 60,000 dwt type bulk carrier MV Elbabe to Liberia’s Mangusta Maritime Ltd, in a ceremony held at its Chiba Works on July 31, 2015. This is the third ship of the shipbuilder’s ”neo60BC” eco-ship design, capable of accommodating up to 24 persons and sailing at the speed of up to 14.5 knots. The 60,438 dwt Elbabe is 200 meters in length, 32.25m in breadth, with a depth of 18.5m. It has four cranes and five cargo holds. The ship has low sulfur fuel oil tanks designed for operation in ECAs (Emission Control Areas). 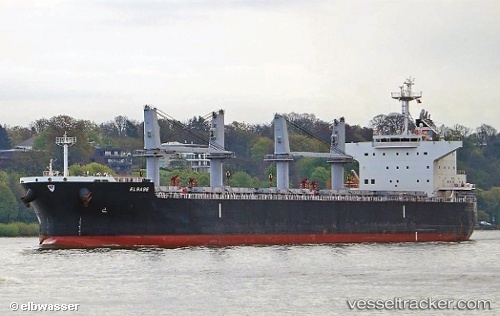 The bulker is classed by NK, and is designed in accordance with IACS Common Structural Rules.